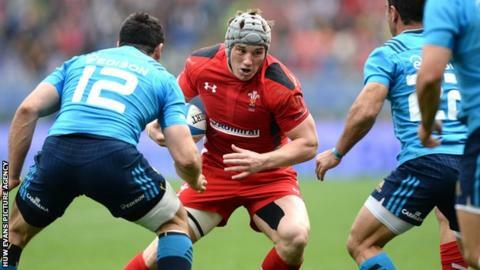 Jonathan Davies' return to Scarlets from French side Clermont could prompt other Welsh exiles to come home, says ex-Wales captain Gareth Thomas. Davies, 27, left for France in 2014 but the Wales centre is set to rejoin Scarlets for next season. "When they see him coming back, maybe the others will follow as well," said Thomas. Wing George North, out of contract at Northampton at the end of the season, is among those playing outside Wales. Other England-based players include Jamie Roberts, Bradley Davies, James Hook and Matthew Morgan, while Leigh Halfpenny, Luke Charteris and Mike Phillips play in France. Dan Lydiate has returned to Wales from French side Racing Metro, signing a national dual contract with the Welsh Rugby Union and Ospreys in December 2014. Welsh Rugby Union chief Martyn Phillips confirmed a deal is close for Davies to return to Parc y Scarlets, once his current Clermont deal expires at the end of the season. Thomas spent three years in France with Toulouse and believes Davies - who missed the World Cup because of a serious knee injury - will come back to Scarlets a "better player". "[Wales coach] Warren Gatland wants all his players at his disposal, closely in Wales," Thomas said. "He'll come back a better article and he'll give a lot to Scarlets but also to Welsh rugby. "He was sadly missed and to have him back now on our doorstep and to be able to see him play week in week out is huge."